BEVERLY, MA- When Annie Bolton, 21, travelled to Phenix City, Alabama, this past spring break to help build homes with Habitat for Humanity, she dreamed of a career in nonprofit work. 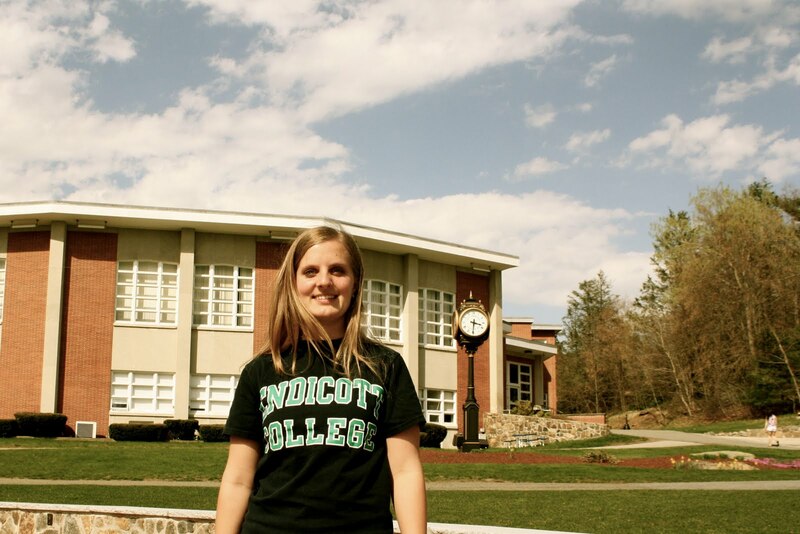 Instead, the Endicott College student body president—who graduated yesterday—knows she might need to refocus her professional goals in light of the current economic situation. Even so, Bolton is confident that her leadership experiences in college as well as her volunteer work uniquely prepared her for a step towards the corporate world. Bolton, originally from Belgrade Lakes, Maine, served as class officer for three years on Endicott’s Student Government Association (SGA), but she knew she wanted to contribute more. Not only did Bolton help make Endicott a more hospitable place, she majored in it, declaring her major, Hospitality Management with a concentration in events management. Her course work came in handy when she decided to run for the top SGA position. “I wanted to be president in order to make the biggest impact possible on SGA and the Endicott community,” said Bolton. She set goals to improve communication with staff, faculty and administration, gain more involvement from other students on campus, and implement new ideas. “Each furthered SGA’s roles and responsibilities,” she said. Bolton helped create new committees for increased collaboration, interaction and involvement. She met with other college student governments on the North Shore to discuss collaborative efforts, and also helped create “seed money,” an extra fund for clubs. The 20 or so clubs that were approved received $250 each. She guided SGA to revamp an activities newsletter into the Clubs and Organizations Newsletter and made it more accessible, so that students know what clubs are doing and what is offered at Endicott. Most of all Bolton wanted to bridge the gap between students and administration. One of the first things she did was conduct a forum in which students could raise questions for her and Endicott’s president, Dr. Richard E. Wylie. Bolton explained that at Endicott, ideas and proposals had often been brought up but rarely followed through to completion. She hopes that as a result of this year’s SGA work, students in the future will create proposals and follow through with them. Cronin said that Bolton is inclusive and looks for consensual leadership. “This is definitely a strong attribute of leadership,” he said. Although Cronin and many others see Bolton as a natural leader, she didn’t always view herself as a leader. Before college she was an athlete, participating in ice and field hockey. But Bolton’s long-time friend, Hilary Curtis, 22, who was involved in their high school’s student government, inspired her to be a part of Endicott’s SGA. From Curtis, Bolton saw the benefits of leadership. Though the two went to different colleges, they remained supportive of each other’s campus contributions. “Hilary and I discussed the importance of being involved in our schools,” said Bolton. Curtis, a health sciences major at Stonehill College in Easton, MA, also graduated May 21. During her college career, she became a cross-country and soccer athlete while Bolton took on student government. Wylie said that Bolton has a passion for Endicott and improving the quality of the student’s experiences. “And she’s an energetic leader,” he said. As president, Bolton also drafted a slew of proposals, many of which take effect in the next school year. The “Fun Fund proposal” will give SGA more overseeing and monetary responsibility and for parties and off-campus events. Until then, what does Bolton hope she’s left behind? One of the best battles in school is discovering understudy pioneers who are keen on driving in understudy government Wylie. Individuals who take the time and set plans, however Annie's one of these one of a kind people. Bolton's long term companion, Hilary Curtis who was associated with their secondary school's understudy government, Animated Explainer Video propelled her to be a piece of. From Curtis, Bolton saw the advantages of authority. Despite the fact that the two went to various schools they stayed steady of each other's grounds commitments. I really enjoy reading your post, thanks a lot for sharing. In order to success in our live motivation has an important role. Through motivating someone we can build a good person. In education motivation leads a student to achieve their goal. Each student's life is depends on how they getting the guidance from others. That is why academic writing services providing the best guidance for students in all academic works. Nice great information, both of which I need, valuable and excellent design botol kesehatan air mineral hidrogen alkastone, as share good stuff with good ideas and concepts, lots of great information and inspiration thanks to offer such a helpful information here. In 2000, about 77% of women in the prime ages of 25 to 54 were in the workforce. However, the tide has turned and mothers challenged with balancing careers and family replica burberry wallets have decided to drop out of the workforce. Yet, at home, they find they long to use their skills in a way that contributes constructively to a business. Another timelessly elegant style from the Michael Kors Collection is the Michael Kors Women's Classic Japanese Quartz Chronograph Mother-of-Pearl Dial Bracelet Watch. With a stainless steel case and bracelet and a gorgeous mother-of-pearl dial with chronograph subdials, this watch combines beautiful aesthetics with the precise timekeeping of Japanese quartz movement. The watch also has a date window between the 4:00 and 5:00, mineral crystal and a push / pull crown. 18, 27 L. Ed. 835. Wonderful Max Factor mascara is the Lash Lift Waterproof mascara. It is also very light and non-flaking like the Lash Lift mascara but it is as well waterproof. This is what makes reapplying of this Max Factor mascara unneeded. 1. The Rotary Women's Mecanique Limited Edition Swiss Made Leather Strap Watch is a great way to spruce up your everyday outfits. The brush finish stainless steel case is available in either silver-tone or gold-tone. There are few days left and we have to say goodbye to this year 2017. We don’t know about you all but for us this year was special and we want to welcome our new year with some Happy New Year Quotes 2018. So just have a look at this page and grab some happy new year quotes for you as well. Am greatly honored to see how Endicott Graduate Combines Hospitality and Presidency, its great and very inspiring. I think that many people would follow their footsteps, since they have a great deal of information to share. One can use Green Vegetation wallpapers to keep their house lively, decoration items that are purchased at very affordable rates. Buy today. Great blog. Your thought really gives the importance of education. This blog Really helpful for someone to get new ideas. Thank you. It is a nice interview with Annie. Her personality is really impressive. She is managing very nicely the president role and her graduation. It will be the inspiration for the students. She is very enthusiastic and always thinking good for the student community. She knows how to deal with the difficult situation in her life. For every student's community, we require leaders like her so that we can see good changes in the education sector. We always looking forward to seeing her at a higher position, she will fly with her wings. It will motivate the students. I found some good educational resources at US writing essays . Thanks for content, i like content. Replica Bottega Veneta Handbags,and so on. Nice blog gaining an knowledgeable information thanks for sharing.